Bomb threats should always be treated as though there actually is a bomb until all facts are evaluated and authorities can thoroughly search the area. 2. Note any pertinent information such as background noises, gender of caller, voice pitches and patterns. 4. Evacuate the building, doing a Two-Minute Scan. The package is labeled “bomb,” “danger,” “do not open,” etc. The package resembles a bomb. The package does not belong to the particular premises or is out of place. The origin of the package is questionable or cannot readily be determined. The physical characteristics of the package are suspicious in size, shape, weight or sound. If a suspicious package or bomb is found, evacuate the area (See Evacuation Procedures). Do not handle it, move it, immerse it or cover it. You do not know how the device is fused. Do not take the time to try to barricade or “sandbag” a suspicious object. If a credible bomb threat exists, the University community will be notified by the DU Alert System and a mass e-mail. Scan your area for things that may be out of order. Employees often recognize objects that are out of place. That information may help Police search more quickly. Do not touch, jar or move any suspicious objects. Do not use cell phones, radios or other wireless devices. 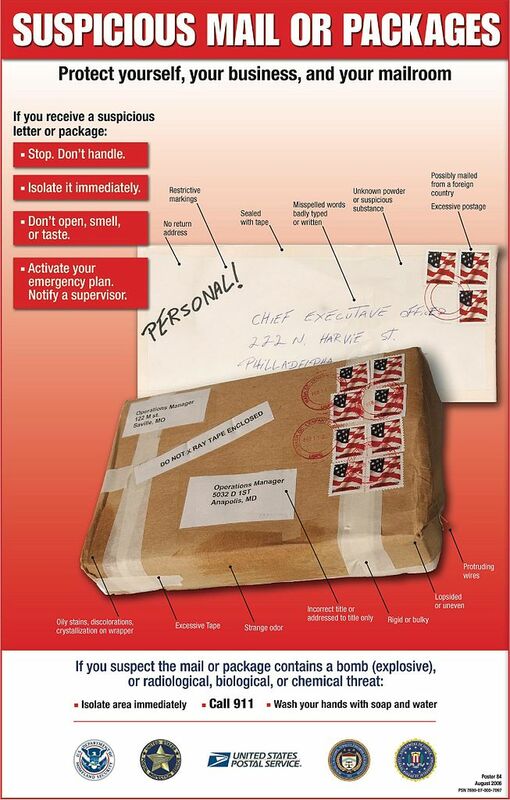 If you have contact with a suspicious package, wash the exposed skin with soap and water after reaching a safe place. Take your purse, backpack and/or briefcase with you. Reducing the number of items to be searched will help get you back in the building sooner. Leave doors, offices and storage spaces open and unlocked.